in a fun online psychology class game. by interaction. Find out the elements for every temperament. Collect fire, water, earth and air essences. 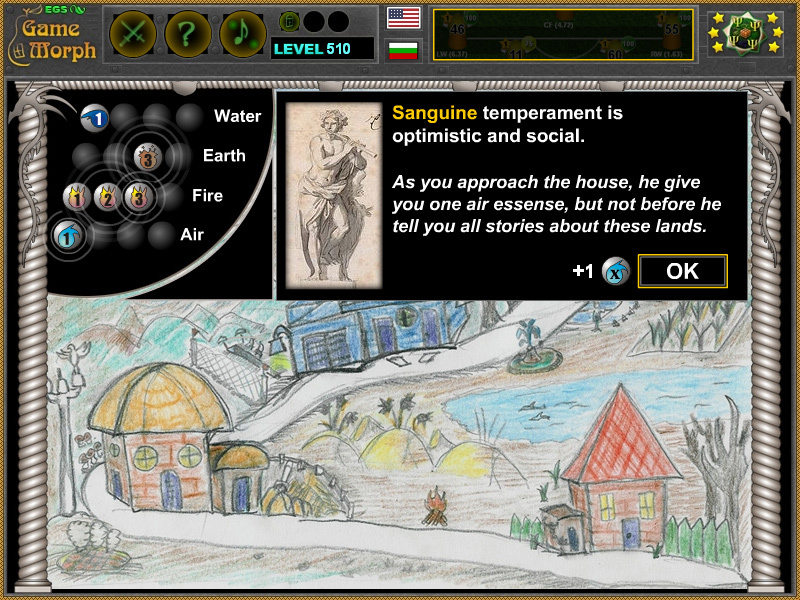 A small quest game for desktop computers, laptops and tablets, which may be played in the web browser. The Psychology Knowledge Board include 15 hidden elemental essences to play with. It is part of the Interactive Mind Studies educational tools. Temperaments theory is controversial and people come in complex of temperaments. Which are the four temperaments types? To what element is every temperament related? What are the character traits of sanguine temperament? What are the character traits of choleric temperament? What are the character traits of melancholic temperament? What are the character traits of phlegmatic temperament? How to call a person who is optimistic and social? How to call a person who is short-tempered or irritable? How to call a person who is analytical and quiet? How to call a person who is relaxed and peaceful? 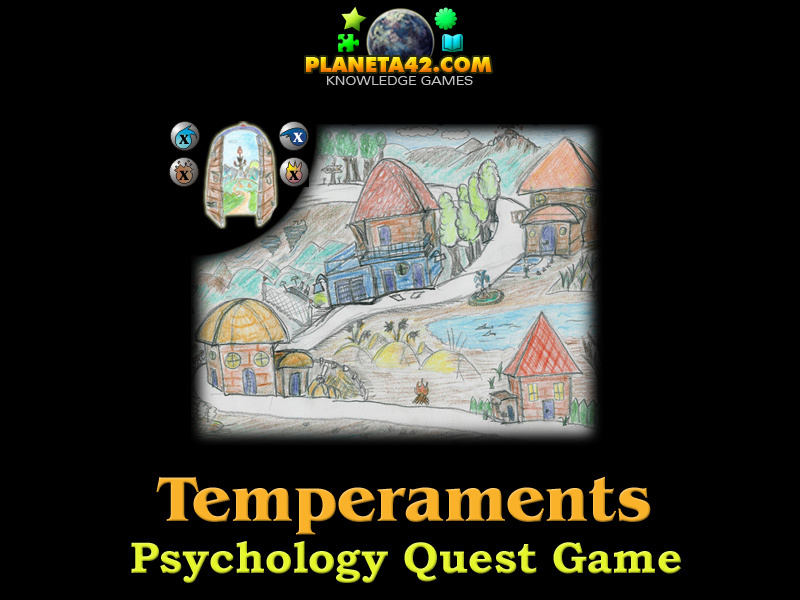 How to play Four Temperaments Quest. Like most quest games, we appear in a fantasy lands with 4 citizens. Following the road we reach a locked doorway, which need four of every type of elements - Fire, Water, Earth and Air. Everywhere on the map, there are secret locations, which will give one essence of the corresponding type. Also the people from the four houses, will give one element, according to their temperament type. When all houses are visited and all hidden places found, the doorway is opened and the game won. Know 4 different temperament types and to which element are they related. This fun class game is about the four basic psychological temperaments. This theory is still contradictional and there is never only one temperament in human personality. One may be a domiant and others minor temperaments. In common psychology every temperament is connected to one natural essence - air, fire, earth or water. Every forth essence to complete the game is located in one of four houses inhabited by one temperament. Here is their reaction to your visit. is analytical and quiet. As you approach the house, he leave one earth essense in fron of the door, trying to avoid contact. is relaxed and peaceful. As you approach the house, he gently give one water essense, then slowly returns to his important tasks. is short-tempered or irritable. As you approach the house, he stand proudly and give you one fire essence, like he is the man i command of these lands. is optimistic and social. As you approach the house, he give you one air essense, but not before he tell you all stories about these lands. Labels: Mind Games , Quest Games , Flash Games , Psychology Games , Education Games , Psychology Class Games.